In 2007 I did the 12-week cookery course at Ballymaloe. I only had to come down the road for it; many of my classmates had traveled much further, coming from England, Spain, Sweden, Australia and America to study in this internationally known Irish cookery school. It was an intense, hard-working, food-filled transition time for me, a hiatus between full-time work in Dublin and freelancing from a country cottage. Darina Allen’s latest book, 30 Years at Ballymaloe, is a celebration of the place, the people and the ethos that underpins the whole enterprise. It’s also a reminder of just how she and Ballymaloe transformed food in Ireland. 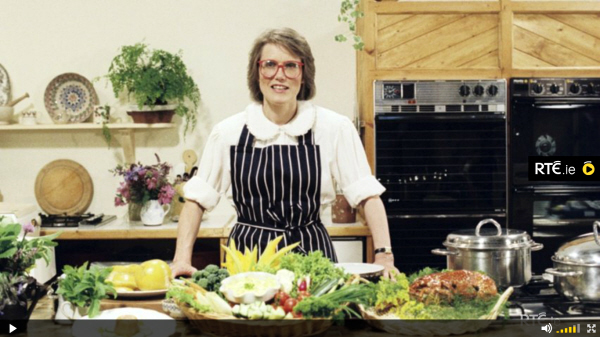 I grew up on a scanty diet of Delia Smith cookery shows, with the odd Keith Floyd series thrown in – not so much food on screen in those days – and Darina’s Simply Delicious was a refreshing blast of Irish air. (You can watch that first programme online here) She used good Irish butter and cream with wild abandon, seasoned liberally and displayed the results in Stephen Pearce pottery. That was back in 1989. Times were tough, butter was the devil’s food and the hotel restaurants that I occasionally visited served neon-pink prawn cocktail, chicken-and-chips and Black Forest Gateau. Unsophisticated heaven to this child of the eighties – but there was little Irish on those unchanging menus. Through Darina’s Simply Delicious books I read in awe of the Ballymaloe House food that Myrtle Allen had pioneered, of mushroom a la crème and Jane’s Biscuits, homemade ice bowls and pickled cucumber. There was an emphasis on, and a pride in, local and seasonal that may have seemed a little out of place at a time when we were just discovering Italian and Chinese food. Now it seems as if the whole country has caught up with Ballymaloe. Suppliers are namechecked on menus, producers celebrated, chefs have their own gardens and using foraged ingredients is de rigeur. Thirty years-worth of students have played their part, setting up restaurants and their own cookery schools, writing cookbooks and, as consumers, demanding high standards. So there’s a lot of the past in 30 Years of Ballymaloe – but it also looks to the future. Darina touches on butchery, sustainable fishing, Nordic cuisine and this year’s Ballymaloe LitFest. Old stalwart recipes like Ballymaloe Brown Yeast Bread and Mummy’s Sweet Scones make an appearance alongside Arun Kapil’s Garam Masala Cookies, Camilla Plum’s Strawberry and Rose Petal Jam and Rory’s Moroccan Harira Soup (not so photogenic when I made it but nourishing and warming in cold autumnal weather). It’s a scattering of recipes around the world, with contributions from chefs and food writers who have done demonstrations at the school over the years, including Claudia Roden, Madhur Jaffrey and the late Marcella Hazan, who writes of a bedraggled trip to Heir Island Cottage. Once upon a time, Ballymaloe was just a place name. Now it’s a cookery school, a country house hotel, an organic farm, a literary festival. It’s a way of thinking and cooking – and very good eating. I loved this bread while I was in Ballymaloe and, before I got a bread machine, regularly made it at the cottage. It’s so easy that kids can do it themselves or, at least, not mess it up while insisting on helping! I’ve adapted the recipe for the dried yeast that I use at home. Use the sunflower oil to grease a 13 x 20cm (2lb) bread tin. Mix the flours, salt and dried yeast together in a large bowl. Whisk the molasses with the water, tip it into the bowl and mix well. I often do this with my right hand, forming what Darina calls a “claw” to stir it around in a circle. The mixture will be pleasingly wet and sloppy. Pour into the tin, sprinkle with sesame seeds, cover with a tea towel and leave in a warm spot. You want to give it enough time to rise to just under the top of the tin, which can take from 10 minutes to an hour, depending on your house. Meanwhile, preheat the oven to 230°C (fanbake 210°C). When risen, bake for 20 minutes, then turn down to 200°C (fanbake 180°C) and bake for 40-50 minutes until it sounds hollow when turned out of the tin and tapped. I often cook it for the last 10 minutes without the tin. Cool on a wire rack, if you can wait. It’s gorgeous eaten – although hard to cut – while still warm with lots of butter and raspberry jam. Like this recipe? There are plenty more to play with in the copy of 30 Years at Ballymaloe that I have to give away, thanks to publisher Kyle Books. To enter – Ireland and UK only – just leave a comment below. 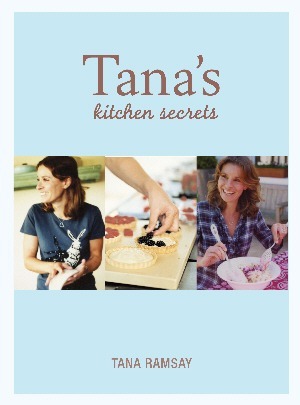 If you don’t win, the book is available from the Ballymaloe Cookery School website – while there, don’t miss entering their competition to win a 2½ day course by matching Darina’s specs with the correct year. Thanks to Kyle Books for the review copy. “butter was the devil’ -I was lucky to have a granny who believed in real butter and when i started college sent me off with a pound of kerrygold every week so i wouldn’t eat ‘ that stuff with the anti-freeze in it’. We owe a lot to the Allens, our mammies cooking and tattered copies of ‘Simply Delicious’. It was always real butter in Richmond Hill! And we had plenty of tattered cookbooks lying around too. I think it was around then that I bought my copy of the grey bible – Darina’s Ballymaloe Cookery Course – used in conjunction with Nigel and Nigella. its great to have someone on the international stage promote Irish food, makes you proud. Looking forward to trying this out at the weekend, hopefully it’ll be like Granny’s been trying to make bread like hers for years. It will never taste exactly like your Granny’s bread but it’s mighty fine eating. We also love it toasted – with lots of butter and raspberry jam, especially if we have a pot of The Green Apron’s Chocolate Raspberry Jam in the cottage. I just love Darina and her whole food ethos. I did a one day nose to tail course and it was fantastic. I’d love to go back and do the full three month course someday. Had a peek at this book the other day and it looks so beautiful and interesting – would love a copy! Is it wrong of me to say that sometimes I wish Darina Allen was “my mammy”. Can you imagine coming home from school to be greeting by big doorsteps of buttery brown bread and homemade jam? What a panacea to a damp anorak, snotty nose, and bloody knees! What a respite before having to face into an hour or two of “Salut Francais” or “Seal ag Leamh 5”! I should add that I love my own mammy (despite her Brennan’s white sliced pan and Yellow Pack jam.) I love you mom! I’ve been making this and their Granary bread for the last few years and my kids live on it. Easy to follow and a joy to produce and eat. Yum ! Yum ! Great with eggs, cheese or Jam. Congratulations! 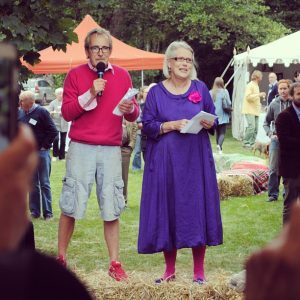 You’ve been chosen – via Random.org – as the winner of 30 Years at Ballymaloe. I’ve just sent you an email about it. .Hope you enjoy cooking from the book. Darina was the go to woman in my house growing up. I will forever remember sitting with my mother watching her programme on RTE!! I would love to win a copy of this book!! Love your blog!! It’s normally the wedding present that I give to friends. Makes a great gift. And you’re right, it does cut down on emergency phone calls! Darina and Myrtle Allen are Irish food icons! I am a trainee chef in a fine dining kitchen and Ballymaloe Cookery Course is like a bible to me. As a student winning this book would mean the world to me 🙂 Love your blog, keep up the good work Caroline! Best of luck with your training, Kim. It’s a long road and it’s good to have some landmarks along the way. the thought makes my heart glow. And if I win? How yummy! That glow will go straight to my tummy! Interesting article I will try the bread. I would love to do the course too! Would love to win a copy of the book – my student finances would never stretch to a course at the school! We call these 3 great ladies the Blessed Trinity. Myrtle, Darina and Rachel. growing up with my granny making bread every morning, she was a true inspiration the trouble was she did a lot of it by eye and if you pushed her to weigh it she said it never worked so some of her versions of recipes dissappeared. 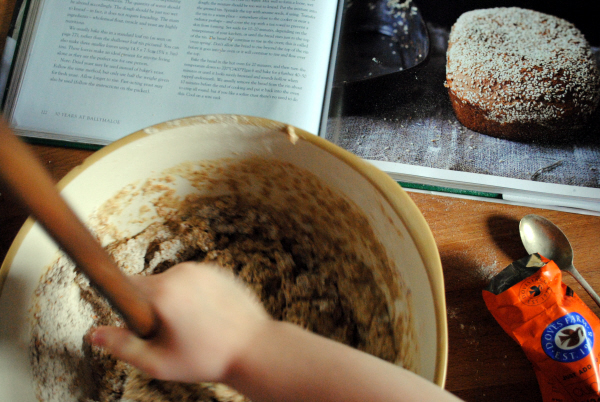 Was thinking i’ll have a go at treacle bread one of these days and see if i could get it anything like grannies, i have loved cooking ever since the first waft of her baking!